Lenovo has unveiled a trio of networking solutions and a systems management software suite that aims to make it easier than ever to manage cloud and on-premise server deployments. The two new top-of-the-rack networking switches are targeted at the traditional IT data center, whereas the accompanying system management suite is designed with small to medium sized enterprises (SMEs), government organizations and service providers in mind. 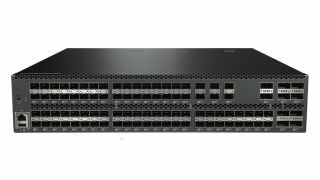 RackSwitch G8296 (x86) and G8272 (x48) are a duo of switches with the cloud in mind that can support Lenovo's storage and server solutions in the data centre delivering low-latency performance for both 10/40GbE connectivity. Alongside those two products is the Flex System SI4091 interconnect module that supports 10GbE or FCoE and will simplify network and interoperability challenges that can sometimes plague IT system administrators. Each one comes with pre-configured settings that save time and money. The price point of just $7,999 (around £5,400, or AU$10,400) combined with less network cabling and a 30% drop in power consumption allows it to offer an 18% lower total cost of ownership compared to its competitors. Lenovo XClarity, meanwhile, is a solution that aims to help SMEs, service providers and government organisations to streamline hardware resource management, increase visibility and control of physical resources, and speed up cloud and traditional infrastructure deployments. It comes in two different incarnations. XClarity Administrator takes the form of a tablet-friendly interface that makes it incredibly simple for any user to find the correct information and act on it in seconds. Core infrastructure tasks such as firmware updates, configuration management and OS deployments can be automated in order to free up IT resources. It can also be integrated with external cloud orchestrations or IT service management software tools like VMware vRealize by using Open REST APIs. As for XClarity Pro, it gives customers even more scope to centralise server management from within the virtualisation management environment. Straight out of the box it comes with the XClarity Integrator for both VMware vCenter and Microsoft System Center as well as the XClarity Administrator. Reducing downtime is where XClarity Pro really shines and it does so by streamlining server management into clusters by moving workloads to and from affected hosts through rolling reboots and firmware updates. It even foresees hardware failures in advance and dynamically moves workloads in preparation. Both the Lenovo XClarity Administrator and Pro will be out in Q2 2015 with respective list prices of $200 (around £134, or AU$259) and $350 (around £201, or AU$389) per managed server.